COLUMBIA, Mo 10/7/15 (Beat Byte) -- "We need accountability in Columbia for our city government. Not a City Manager who is accountable to no one," 50th District Missouri House Representative Caleb Jones Tweeted Sept. 26. His tone turned cryptic -- and ominous. "Expect changes." The Twitter conversation -- between Jones; State Senator Kurt Schaefer; and Jason Rosenbaum, former Columbia Tribune reporter and one of Missouri's top political journalists -- highlighted ideas Columbia City Hall watchers say will play prominent roles in the 2016 Mayoral election. City manager Mike Matthes must be more accountable to the City Council, while both Mayor and Council must share more power with city administrators. The city manager writes the annual budget; introduces and directs virtually all legislation; sets the Council's bi-weekly agenda; and often serves as lobbyist-in-chief for key ordinances. Defying city law, Mr. Matthes orchestrated a series of "emergency", off-agenda meetings to approve Opus and two other downtown-area student apartments last year. The Tweets reflect ongoing statehouse angst with Columbia policy makers that started with Blight/EEZ in 2012, continuing this year with a proposal to ban plastic grocery bags. 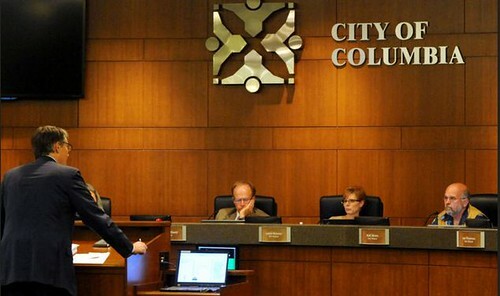 "Should Columbia have a 'strong,' full-time Mayor similar to Florissant or St. Louis?" Rosenbaum Tweeted. "Most cities that have grown and developed in the last 20 years have had a strong Mayor," Jones -- whose district includes parts of Columbia -- responded. "There are pros/cons to the approach, but it would probably incentivize high-quality candidates to run for Mayor," Rosenbaum Tweeted back. 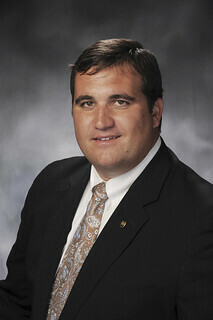 "As of now, CoMo's Mayor is basically an at-large Councilman." "And it shows," concluded Sen. Schaefer, himself the object of controversy over Planned Parenthood. "There need to be changes." 1) With over $250 million in cash on deposit at banks and investment firms, City Hall won't move adequate monies into its General Fund, which pays for police, firefighters, and other city services. 2) Pretending the General Fund is "broke", city officials -- most notably Mayor Bob McDavid -- insist voters must pay higher taxes. When tax inititiatives fail at the polls -- as higher property taxes for more cops did last year -- city officials reduce services, blaming voters. "The city council, the city mayor and the city manager all feel they can just tax the citizens of Columbia, Missouri more," Jones told KMIZ. "And whenever that doesn't happen, supplying adequate protection against people who could potentially harm them is not a priority anymore." Bipartisan statehouse angst with Columbia policy makers entered the controversy over Blight/EEZ, a developer-friendly tax incentive program Mayor McDavid introduced and championed which relied on blight declarations and eminent domain to prod redevelopment projects. Schaefer (R) and then-Rep. Chris Kelly (D) sponsored a bill limiting blight and eminent domain under these circumstances. A Republican-led push-back on Columbia's plan to ban plastic grocery bags survived a Gubernatorial veto last month.